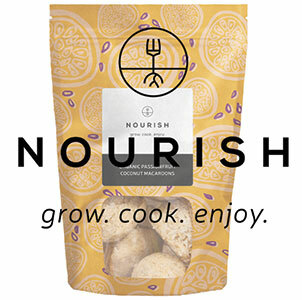 Nourish – Grow Cook Enjoy is the small company making a big noise about Organic Coconut Macaroons. Based in the beautiful Surrey Hills, Ineke and her amazing team create delicious Coconut Macaroons that are Organically certified, and contain no refined sugar, dairy or gluten. Nourish was founded by Ineke Nugteren. Ineke is a registered nurse and it is, in part, her professional background that led her to seek out a healthy alternative to the usual sweet snacks that were available to her and her young family. After seeing the sure and steady changes in health, mood, happiness and overall wellbeing from having a more nourishing and vegetarian friendly diet, Ineke decided to set up Nourish – Grow Cook Enjoy. Ineke started small, originally creating a handmade product from her own kitchen. With a wide range of flavours of the Macaroons, the core range being vanilla, cacao, red velvet, passionfruit (A Great Taste award winning flavour), strawberry and mini raspberry crunch, there is something for everyone. The packaging is bold and beautiful and follows through both the sharing pouches and the single options with their handy, yet great looking, display box. Nourish’s Macaroons can be found up and down the country in numerous stockists such as Applejacks, As Nature Intended, Harrods, Revital, Whole Foods Market and Daylesford. There’s also a huge selection of carefully researched healthy recipes on the website below where you find out how to whip up the healthiest, most nutritious and delicious meals, whether for breakfast, lunch, dinner and dessert, as well as a selection of drinks, smoothie and teas. For extra information, you can always phone on the number below to speak to a member of the team. Why not subscribe, on their website, for their weekly newsletter, which contains special subscriber events, offers and recipes. This entry was posted in News and tagged Natural & Organics. Bookmark the permalink.